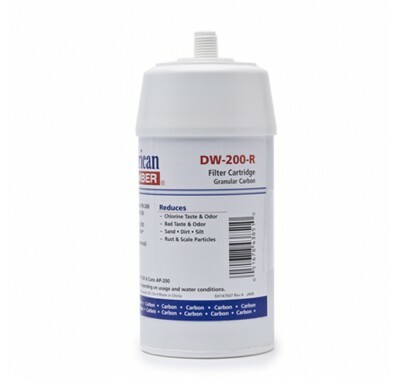 The American Plumber DW-200R Water Filter Cartridge is a filter cartridge designed for the Cuno AquaPure AP-200 Water Filter Housings and the Purwater PW-200 Filter Housings. The American Plumber DW-200-R water filter reduces chlorine taste & odor, sand, dirt, silt, rust, scale and sediment. Features a 1/4-inch thread on the outlet end. Filter needs to be replaced every 6 months or 2,000 gallons, depending on water usage and water quality.